Signature: Signed in the plate, bottom right. The edition was not hand-signed. Edition: From the unsigned edition of 250 on Van Gelder wove printed by Fort for Vollard in 1913. There was also an unsigned edition of 27 or 29 on Japan laid, and, prior to steelfacing, also about a dozen mostly signed proofs. Apart from one inconsequential, rare, and unpublished etching of 1899, Picasso began printmaking in earnest in 1904-1905 with a series of fifteen etchings and drypoints. The first of these was Le Repas Frugal, widely considered one of his very best prints, a testament to a genius that could master a new medium so readily and so completely as to emerge at its pinnacle by the time he had completed a single work. One of my favorite prints of the series is this corpulent, aging acrobat. 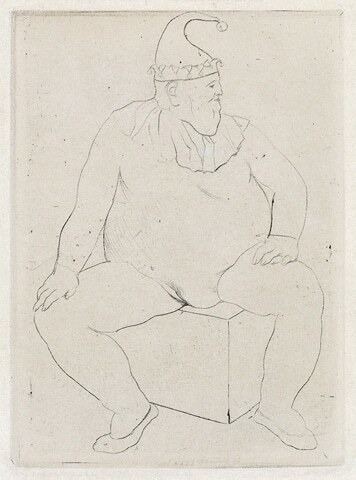 Picasso’s first art dealer, Ambrose Vollard, published and cleverly packaged these etchings and drypoints as La Suite des Saltimbanques. The term Saltimbanque refers to the itinerant street performers, such as clowns and acrobats, who had entertained Europeans for centuries, despite the fact that the best prints in the series are portraits that have nothing to do with the circus. The Suite includes all the prints of Picasso’s Blue and Rose Periods, both temporally and stylistically, if not in coloration (they are all printed in black ink) and are therefore the only Picasso prints that would strike the fancy of the typical Picasso hater, who likes only the Blue Period (such as my dear mother—I know this syndrome all too well). In general, these etchings and drypoints are very charming in that classically Blue and Rose Period sort of way: not necessarily with its famously elongated line (a number of the figures are frankly rather squat, especially this one), but with that certain nobility amid poverty and sadness that we’ve seen in the paintings of this period. Now isn’t it just like that jokester Picasso to choose about the smallest format of the Suite to portray his very widest subject? !